I can't tell you how many times I've searched for a dress at the eleventh hour all the while haunted by one I ogled over months earlier. You know the one. 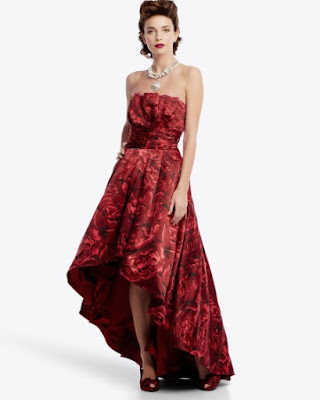 The drop-dead gorgeous if-I-had-somewhere-to-wear-it-I-would-buy-it dress that you'll never see again. The one that no other dress could ever live up to. Oh, the agony. My elusive dress: a rose print, full-length strapless dress with crumb-catcher neckline and asymmetrical tulle-underlay balloon skirt with hidden pockets that White House Black Market created for their limited Holiday Collection in 2009. Aghhh! I die. Well, two years later I still pine. So, in an effort to claim the gown as my own, I decided to give it the One Piece, Five Ways treatment. That way I can pretend like it's in my closet just waiting for its debut.